Victoria’s Caitlin Ward etched her name onto an illustrious honour roll with a fairytale victory in the elite women’s sprint, while 2019 world champions Kelland O’Brien and Amy Cure surged to scratch race gold at the 2019 Cycling Australia National Championships Brisbane. 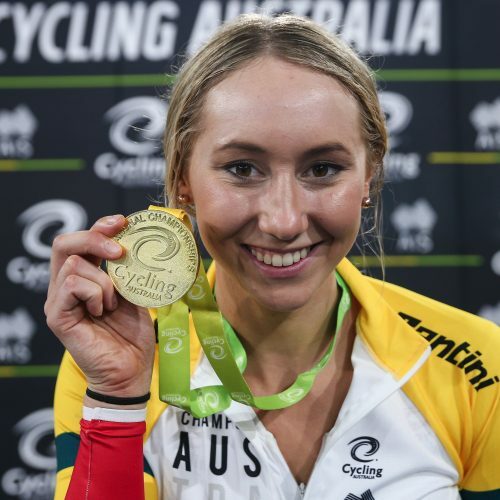 Victoria’s Caitlin Ward etched her name onto an illustrious honour roll with a fairytale victory in the elite women’s sprint at the 2019 Cycling Australia National Championships Brisbane. The result puts Ward’s name alongside the likes of Anna and Kerrie Meares, Kaarle McCulloch, and Stephanie Morton with the four dominating the top step of the podium for the past twenty years. Ward opened her account with the first sub-eleven second ride of her career which saw her Friday’s qualifying session (10.997). Ward knocked out Felice Beitzel (ACT) in the quarter-final, before a measured semi-final defeat of fellow Victorian Madison Janssen saw her progress to the mouth-watering final against the two-time champion Kaarle McCulloch (NSW). In the final, Ward surged in the front straight to reel in McCulloch in two heats, with a photo finish decision by the commissaires adding suspense to the dramatic victory. “I was super nervous going into tonight, I’ve raced Kaarle a fair few times and last year I beat her in the semi’s so I knew it wasn’t impossible,” explained Ward who won sprint silver in 2018 and bronze 2014. “I knew I had to back myself and I just kept telling myself I can do this. The win comes after a challenging three years for Ward in which she was forced off the bike for 15 months due following a string of injuries including a crushed ankle. Late in 2018 Ward joined the Australian Cycling Team Podium Potential Academy and enjoyed a return to the World Cup scene in January where she posted a personal best result in the sprint. In a thrilling sprint to end the scratch race, Amy Cure (TAS) held off a late charge from teammate Georgia Baker and a surging Ashlee Ankudinoff (NSW) to clinch a third straight title. Cure made an ambitious breakaway with 15 laps to go of the 40-lap race with Josie Talbot (NSW) and Chloe Moran (SA) before Alex Manly (SA) reeled in the trio with a handful of laps remaining. Cure and Manly went clear, however with the chasing bunch in hot pursuit, the pair sat up to set up a sprint finish, with Cure showcasing her class as she held on for the win. “It was really good, I was happy to cross the line first but I wasn’t sure how I was going to go as I’ve been a bit sick so I’m really happy with my performance tonight,” said Cure, who will look to defend her points race title on Saturday’s final day of competition. Dual team pursuit world champion Kelland O’Brien (VIC) claimed the elite men’s scratch race national title, holding off Ben Harvey (NSW) and South Australian Josh Harrison in an intense sprint to the finish. With 21 laps to go of the 60-lap race, O’Brien reeled in the early breakaway pairing of 2018 champion Josh Harrison and Victoria’s Luke Plapp. Sporting the rainbow bands, reigning world champion Sam Welsford (WA) lead a chasing bunch which absorbed Plapp, while Harvey gave chase to join the leading pair. However, O’Brien was too strong as he overpowered the pair on the final lap to claim his fifth national title. “It was a super hectic race, it’s such an iconic race at the national titles and it’s usually raced really hard, tonight it was done a bit differently to how I’ve seen it raced in the past so it was a bit of a shock to the system but I’m so happy to take the win,” said O’Brien, who will be out to add to his haul when he heads out to defend his points race title on Saturday afternoon. 2018 junior world champion Thomas Cornish (NSW) claimed his maiden elite national title with victory in the one-kilometre time trial. Cornish clocked 1min 1.653secs for the four laps to take the win ahead of Victorian Godfrey Slattery (1:03.004) and Tasmania’s Josh Duffy (1:03.258). “It feels great to win the elite jersey, coming off juniors and being the current junior world champion there was a bit of pressure behind me so it’s always good to back up the expectation and have a win,” said Cornish, a member of the Australian Cycling Team Podium Potential Academy. Ella Sibley (SA) claimed her second national title of the week with victory in the time trial. In remarkable scenes on the opening day, a mid-race blood nose left Sibley with blood on her face and skinsuit as she rode to victory in Wednesday’s scratch race. Sibley clocked 36.342secs to edge sprint and team sprint champion Heather May (36.853) while New South Wales’ Eliza Bennett (36.943) won bronze. Victorian Graeme Frislie won his third national title for the week, adding to his team pursuit and scratch race wins with a victory in the men’s time trial. Frislie (1:03.582) took the gold ahead of New South Wales’ Rohan Haydon-Smith (1:03.797) with Lewis Walker (SA) rounding out the podium (1:04.211). In the women’s points race, Victorian Ashley Jones won her second national title with a brilliantly controlled effort. Jones took the lead early and steadily accumulated points for the rest of the race to finish with 33 points, 19 points ahead of Queensland’s Francesca Sewell (14) and Lauren Robards (QLD) who claimed the bronze with 12 points. New South Wales’ Kurt Eather put in a beautiful ride for the green and gold jersey in the men’s category finishing with 33 pts. Eather and silver medalist Bill Simpson (VIC) staged an early tussle, before Eather took the race on in the second half, claiming the ten points on offer in the final sprint and celebrated his title to the roar of the growing crowd. Rounding out the podium was Oliver Bleddyn (WA) who finished with 14 points narrowly beating Victorian Henry Dietze (12). In the men’s Keirin final South Australian Carlos Carisimo (10.90) narrowly edged Victoria’s Sam Gallagher for gold, with South Australia’s Jaden Rollison joining the pair on the podium. Eliza Bennett (NSW) took her first title of the Championships as she beat teammate Tasmin Davies (NSW), while South Australian young gun Ella Sibley continued her medal haul with bronze. The Championships is also part of the Brisbane Cycling Festival which runs March 26 – April 14. Catch all the action from #TrackNats on Cycling Australia’s facebook stream or on the Kayo Sports App .